Musician and Programmer of Text to Music and new forms of experimental music that uses everyday written text and computer generated software to create New Experimental Sounds Compositions.. Please take a moment and Visit it and start to Follow it if are not already doing so.. Exploring the Musical Patterns of Computer Generated Music Through all its mediums and concepts such as Fractal Music ,Algorithmic Music & Text to Music.. Sharing the software I have created along with all the other programmers and musicians that have created Algorithmic Composition Software. As a Artist I have Released Over 26 albums of experimental sounds. Through the use of Algorithmic Composition Software I have been able to explore the concepts of converting text to music rendering music out of images. 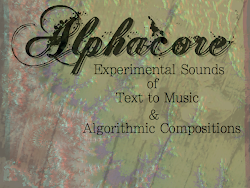 Feeling that virtual noise of computer generated music has a lot to offer and a endless amount left to explore..
comes Ambient Drones, Outright Fractured Beats and Abstract Noise Art..
All songs are written, arranged, played, produced, mixed and mastered by Alphacore. if you like to book me for a gig in your area please contact me I'm willing to travel anywhere anytime..